Are you having trouble when Filezilla is slow while uploading or downloading files? By default, the FTP transfer speed between the client and the server depends on many factors: Internet Service Provider limits, FTP server and client settings etc. In such situation user can only control the settings of its FTP client. 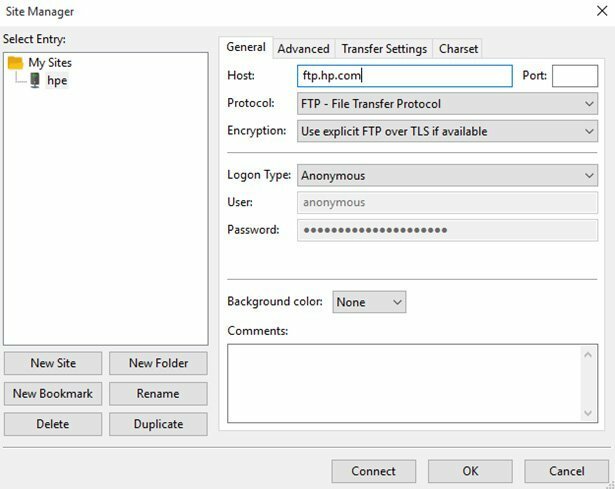 By default, the FTP Client Filezilla is installed with minimal settings that limit the maximum allowed connection speed to the FTP server. But if you change a few things you can speed up Filezilla and increase your download speed by over 2Mb/s. Go over to the Transfer Settings tab and check Limit Simultaneous connections option. Then input 10 for the Maximum Number of Connections (by default FileZilla use only two simultaneous connections). This way you will allow the FTP client to download or upload simultaneously 10 files in parallel threads, which significantly speeds up the overall speed when transferring multiple files. This will optimize your connection speed with most of the servers speed to get the highest one and without need in a disconnecting (during our tests download speed jumped from 900KB down to 2500KB down just from changing this single option). Also check that Passive transfer mode is selected. This is recommended mode for client computers behind NAT or proxy. In case you have direct internet connection and dedicated IP address, you can try to switch to Active FTP transfer mode. Note. The main difference between the active FTP mode and the passive FTP mode is the side that opens the data connection. In the active mode, the client must accept connection from the FTP server. In passive mode, the client always initiates the connection. 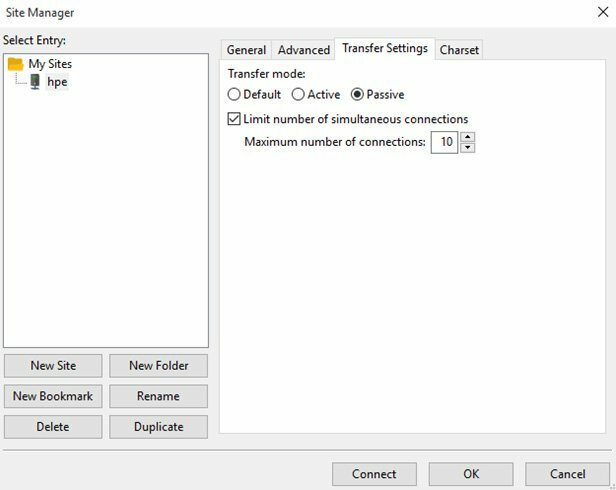 If you want to change default FileZilla behavior for new FTP connection, go to the top menu Edit -> Settings -> Transfers. Under Concurrent Transfer section, change Maximum Simultaneous Transfers to 10. 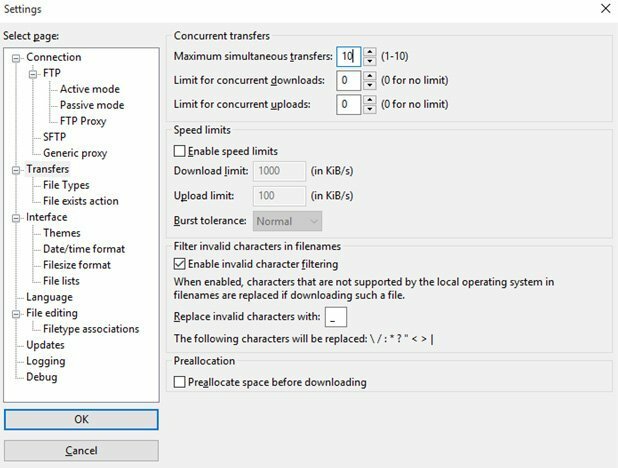 In addition, to speed up Filezilla, you can try to run a second instance of the program, which will also transfer files in 10 concurrent sessions. Filezilla Downloading Speed Remains Slow? If the steps described above didn’t help you and that doesn’t increase the speed, most likely you set a limit on your ISP (ask your ISP how many simultaneous connections the server supports); or on the web server you are connecting to (if you use Filezilla FTP Server, increase the values of Internal transfer buffer size and the Socket buffer size. We have experienced hosts like GoDaddy tightly restricting their speeds on FTP. I would like to thank you for your suggestion as that does help speed up the transfer rate. My speed went from a measly 250kbps to 1.4mbps. Glad to hear it 🙂 ! hello it not working 🙁 how can increase our upload speed on filezilla please help me…. If this trick doesn’t increase your speeds, it is most likely due to a limit on your ISP, or on the web server you are connecting to. I have experienced hosts like GoDaddy tightly restricting the speeds on FTP, and that is one reason I don’t use them. Hopefully that helps. my speeds are from my seedbox at 164.395 mbps is this ok? We glad you enjoyed it, Mayur! It really works. Speed jumped from 60 KBps to 200 KBps. Thank you. It helped a lot. I dont think this software provides multi threaded file transfer because the speed was quite slow when I did FTP transfer. After searching for similar software I found GS Richcopy 360, helped me to a great extent, the speed has now improved very much. Instead of using FileZilla, I use GS RichCOpy 360 (it has an option to transfer files over TCP port) and works great transferring millions of files quickly! I knew my connection speed was not the issue after transferring 100Mbs in 1 hour. Upon changing FileZilla to 10 simultaneous connections, Boom 400Mbs transferred in 10 minutes. Thanks for the FTP speed increase tip. My only question is? Why have the developers not made this the default setting.